Over the top first – Skaven Assassin. Clan Eshin is freaking COOL! The whole idea of Warhammer Clan Eshin is great. Assassins are trained in their dexterity and fighting skills – somewhere in Cathay or Nippon and then after only the best of the best survived the training, they are ready to be hired for assassination. No Skaven Warlord or Grey Seer should feel safe – the competition is fierce. If you are too successful and you go up in the society ladder – other Lords and Warlocks become envious and jealous. For the right price, Assassin gladly will take off the one who goes too well. 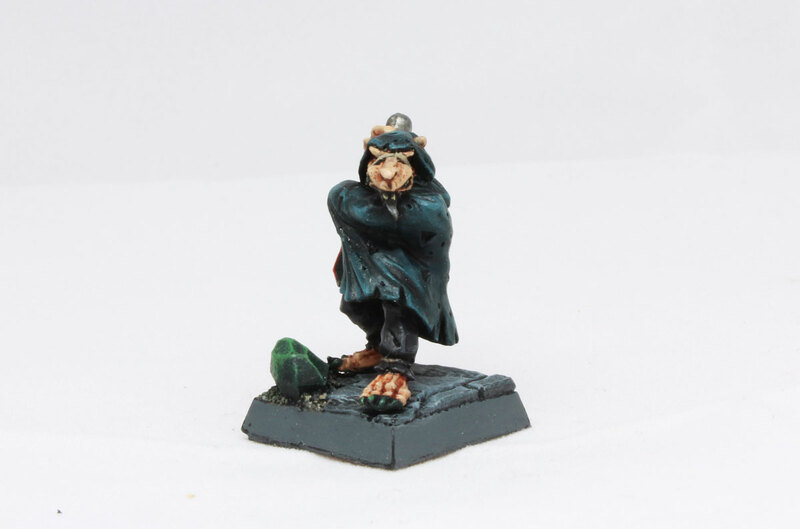 No rat is certain of his fate in Skaven Underempire:). The whole idea, I’m able to put assassin model to my army sounds like super fun. 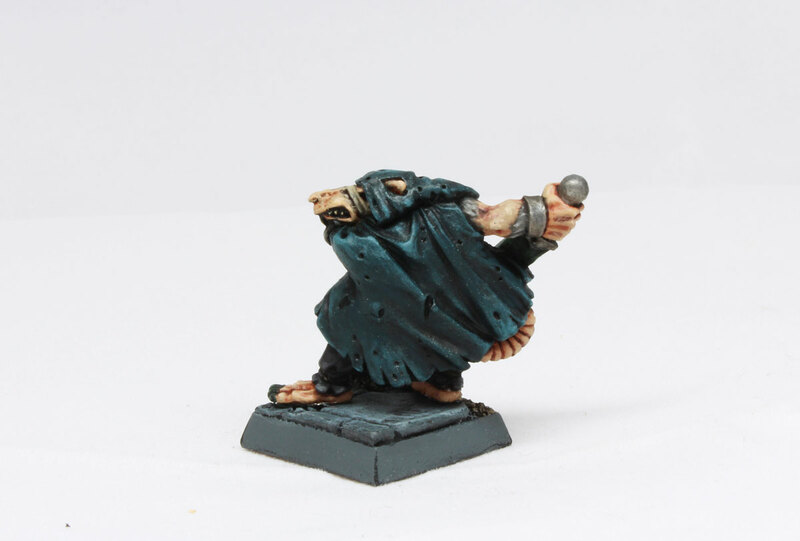 I have this guy hidden in my Clanrats Unit and when the time comes – he strikes from the shadows! No hero nor champion in opposite army is safe, when Clan Eshin send its agent to help Grey Seer in his efforts to please Council of Thirteen. I know it costs a lot (points or warp tokens – whatever you choose:), but this will be fun. I think the last time I’ve used Skaven Assassin it was the time of 5th edition of Warhammer Fantasy Battle. During that era Assassins were ordinary models, part of the units, not like right now – part of Characters choice. Their statistics were worse, they couldn’t take any magical items, but they were cheaper though. I used them once or twice, but they always failed to deliver any significant damage. In 7/8th edition Assassin is upgraded – he is character right now, but still, due to high point costs, still I use him rarely – mostly because what I just wrote, and of course because I didn’t have any painted Assassin miniature so far. Until now. In Warhammer: Age of Sigmer Skaven Assassins have cool rules too. They still are able to stay hidden in regiments, they hit on 3+, wound on 3+ with 3 attacks and when they attack enemy hero, they can re-roll failed to hit rolls (the ability is called: Slay-slay leader prey:). Looks OK to me – but I haven’t played AoS yet and don’t’ have any clue how it could work in the game. Eventually, some day, I’ll try to play Age of Sigmar, but I’m not in a hurry. Still prefer 8th and previous editions in Old World setting:). 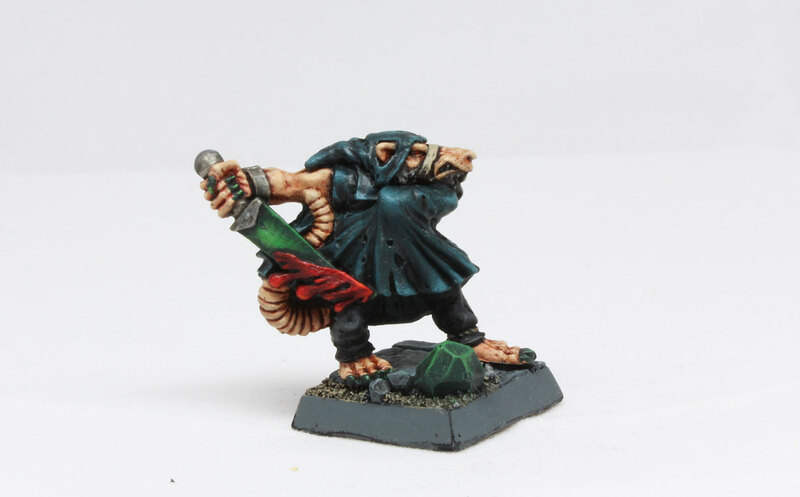 The model is an old aroundish 5th edition (I’m not entirely sure which year it was released – mid 1990s) metal miniature of Skaven Assassin. One weeping blade in hand and the posture suggesting he just appeared from the shade, and his intentions are not friendly:). I painted his cloak with Citadel’s Incubi Darkness, pants are black, and the blade is typical way I paint warpstone – Caliban Green as a base, layer of Nuln Oil and lightened with Warboss Green and Warpstone Glow. On the blade red coloured poison (Mephiston Red/Evil Sunz Scarlet/Troll Slayer Orange). Basing is like all bases for my Skaven army – Fantascape resin Wyrdstone mines (and as you can see – still square:). I’m quite happy with effect. It’s going to present awesome among Clanrat unit, when finally he reveal himself to kill-kill! All is left to complete my effort with building Skaven army is : Doomwheel (plastic version) and two Jezzail teams. I already started to paint Doomwheel – it’s super fun to paint – lots of details – machines parts, cables, warpstones, and crazy Warlock Engineer in the middle of it. It will bring destruction to the enemy very soon! Right after it – Jezzails. It’s kind of similar story like this Assassin – never used Jezzails regularly. Right now I want to try them again in the battle. These two rifles will do perfect for the try. Meanwhile – back to my Doomwheel! Such a classic model! Absolutely love this.